A persistent effort by Spokane firefighters spared the majority of a South Hill residence this afternoon from fire damage. The Spokane Fire Department was dispatched at 12:03 PM on June 27, 2013 to find fire throughout the attic of a single story house at 4228 East 16th Avenue. Due to a number of simultaneous large scale emergencies (water rescue and hazardous material response), three engines, one ladder and a chief were dispatched from the remaining available companies in the City. When the first company arrived, the officer reported heavy smoke showing from the eves and roofline of the structure. The call was then upgraded to a working incident, which added an additional engine and AMR ambulance to support the alarm. Companies were successful in laddering and ventilating the structure’s roof under fire conditions within minutes of arrival. Simultaneously, members from arriving engine companies immediately stretched hose lines to the fire’s origin above and prevented it from consuming any more than one-third of the entire structure. The fire was extinguished in just 45 minutes, and one firefighter injury occurred (minor injury, first aid only). Spokane Fire District 8 provided breathing air support at the scene due to the SFD's Heavy Rescue being commited to another incident. The cause remains under investigation by the Fire Department's SIU. Damage is limited to the structure's attic and roof; additionally there is smoke and water damage in limited areas. The only occupant was outside when the fire was discovered and was not injured. 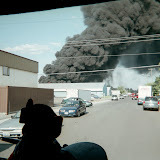 On June 27, 2013 at 01:09 AM, 6 Companies of Spokane Firefighters, 1 Senior Ladder, 4 Engines, 1 Heavy Rescue under direction of Battalion Chiefs Donahoe and Moline were dispatched to a reported basement fire at 1520 North Post with all the occupants reported to be out of the building. Spokane Engine 3 from the West Central Neighborhood arrived on scene within 4 minutes and reported a fire visible through a window in the basement of a story and a half wood framed structure. Engine 3’s crew then made an aggressive interior attack on the fire. The first arriving Chief then upgraded the incident to a working fire due to the potential of flame spread from the basement up the walls of the balloon framed structure. This brought another dedicated ladder company, an ambulance and an investigator to the scene. Companies were assigned to attack and confine the fire, search for extension, complete a primary search and ventilate the structure. The fire was declared knocked down within 5 minutes and confined to a pile of bedding next to the dryer in the basement. All occupants were confirmed safe outside the structure and there were no injuries to civilians, pets or firefighters. Damage was confined to the pile of bedding with no structure damage. There was slight smoke damage throughout the home. The single family dwelling was released to the building owner after the atmosphere was deemed safe and the burnt bedding was removed from the home. The Special Investigation Unit has determined the cause of the fire to from oil soaked bedding that had been ran through the washing machine and then ran through the dryer which added heat to amplify the process of self heating of the oil soaked fabric which had been bagged up and left on the floor. The occupants were very fortunate to have had a working smoke detector in the basement that alerted them of the fire in the incipient stage. The basement had a heavy fire load and could have had a much different outcome without the notification.